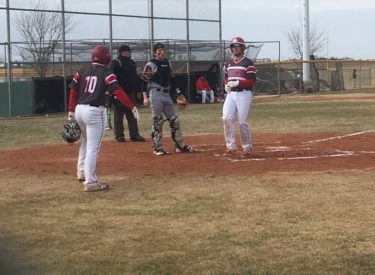 The Redskin baseball team is 4-0 after sweeping Ulysses Tuesday at the National Beef Family Sports Complex. The Skins took the first game 15-0 and won game two 16-1. In game one, Braxton Hyde pitched four hit-less innings for a no hitter. He struck out six and walked four. Cesar Burciaga was 3-4 with three RBI’s, three runs, and a double. Pancho Terrazas was 2-4. Brodie Warren was 1-2 with two RBI’s and a double. The Redskins scored five in the first, one in the second, five in the third, and four in the fourth. In game two, Brodie Warren pitched three strong innings allowing one run for the win. Javier Bojorquez pitched a scoreless inning of relief. Ulysses had 14 errors. Bojorquez was 2-2 with three runs. Braxton Hyde, Cesar Burciaga, and Eithan Green scored three runs a piece. The Redskins open WAC play at Great Bend Tuesday at 4 on 1270 and kscbnews.net. Redskin Pre-game begins at 3:45.